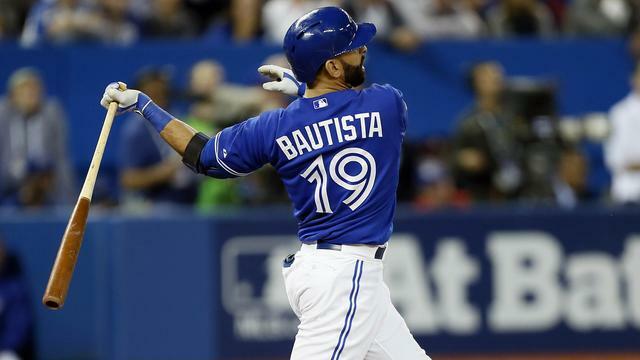 2015 Season: The Toronto Blue Jays mashed their way to the top of the American League East in 2015, storming back to take first place away from the New York Yankees in the second half of the year. This storming to the top of the division and 93 wins was precipitated on some excellent mid-season trades for lefty ace David Price and shortstop Troy Tulowitzki. These two came over to the Rogers Center and along with AL MVP Josh Donaldson helped bring Canada’s team to its first playoff appearance since 1993. The Jays led the league in most offensive categories such as runs (by over 100 on the 2nd place Yankees), home runs, and nose hair (yes, Major League fans… like a party favor). After winning the division, they came back to beat the Texas Rangers in the Division Series before falling to the eventual World Champion Kansas City Royals in the ALCS. Key Additions: The Jays spent most of the offseason making smaller moves to sure up some of the weaker areas on the team. They added reliever Drew Storen from the Washington Nationals in exchange for outfielder Ben Revere who should take over the 8th inning for the Jays in what is shaping up to be a lethal 1-2-3 punch at the back end of the pen along side second year reliever Roberto Osuna and lefty Brett Cecil. Veterans David Aardsma and Gavin Floyd were also added for bullpen depth. On the starting rotation, Toronto added lefty J.A. Happ who had a resurgent second half to 2015, along with righty Jesse Chavez who will probably begin the year out of the bullpen but will be the first man up if an injury arises. Key Losses: The biggest loss is easily David Price. Price, after coming over in a trade from Detroit at the deadline, was lights out during his stint above the boarder, recording a 2.30 ERA in 74 1/3 innings and was a huge catalyst in getting Toronto back into the postseason. While the Jays were not willing to find a 1-for-1 replacement arm for Price, they will be relying on Marcus Stroman (who made just four regular season starts due to a torn ACL), Aaron Sanchez (who made 11 starts before missing time due to a lat strain), and newcomer J.A. Happ to make up for the production lost by Price’s departure. Elsewhere, the Jays saw lefty Jeff Francis and righty LaTroy Hawkins retire while starter Mark Buehrle remains a free agent as he too also considers retirement. Power arm Mark Lowe is no longer a member of the Blue Jays bullpen, backup catcher Dioner Navarro is gone, as is infielder/mascot Munenori Kawasaki and outfielder Ben Revere who was traded away for Storen. God, I loved watching this lineup last year. There is currently no better 2-5 in the game as Donaldson, Bautista, Encarnacion, and Tulo are all capable of hitting 35+ home runs and driving in 110+ runs. This offense scored 891 runs a year ago, nearly 130 more then the Yankees in second and more the 200 more then the league average. With a full season of Tulowitzki, who came over from Colorado at the deadline, this offense should remain near the top of the game. I say ‘near the top’ not ‘the top’ because I expect some regression from this group. First off, a ‘full season’ of Tulowitzki is a fallacy, as the slugging shortstop has been a constant injury concern, playing an average of 109 games a season over his last 6, topping 130 games only once during that span. After Tulo, it is normal to expect regression from three players (Donaldson, Bautista, and Encarnacion) who each hit 40 home runs a year ago (not an easily repeatable feat), all of whom are on the wrong side of 30. Encarnacion seems to constantly be playing through some type of ailment and is already hurting before the season begins, Bautista is 35-years-old and expecting him to put up these numbers consistently moving forward is unlikely, and Donaldson absolutely decimated his career highs in all offensive categories a season ago and probably will not put up MVP numbers in back-to-back years. Obviously I am assuming that all 4 of these players will hit the hell out of the ball in 2016, but expecting 40 homers and 120 RBIs from each of them is probably more of a pipe dream then a reality. Speaking of players who should regress, Chris Colabello simply is not going to hit .321 again. Not gonna happen. He is a very good player and is clearly a better offensive player then many gave him credit for, but a batting average around .290-.300 seems far more likely then .321. Kevin Pillar is a fantasy sleeper if he can hold on to the top spot in the lineup with that gauntlet coming after him. Pillar tended to play towards the bottom of the lineup a season ago, but with his speed and high contact rate, he could fit very nicely at the top. It will be interesting to see what happens in left field and second base for the Jays, as Michael Saunders (another constantly injured player) will probably get the first crack in left field with 23-year-old Dalton Pompey who is considered by many a Top-50 prospect, but spent most of last season at AA and AAA after failing to hold down center field in 2015. At the keystone, Goins and Devon Travis will battle it out. Travis was a revelation for the first two months of 2015 before he went down with an injury and failed to stay healthy, or produce, when he returned to the lineup. Goins, a nice little player, is a very average second baseman but Travis could be a difference maker if he can stay on the field and produce like he did. These two positions will be interesting to watch during the first couple months of the season. This is an interesting group to judge. Is this rotation currently as good as they were at the end of 2015? The loss of David Price makes that answer obvious. But this rotation could be more than above average if certain pitchers step up. Marcus Stroman may have the biggest spotlight on him as he pitched extremely well last year before tearing his ACL and missing the season. He is projected as a potential top-of-the-rotation arm and his success could ease the loss of Price. 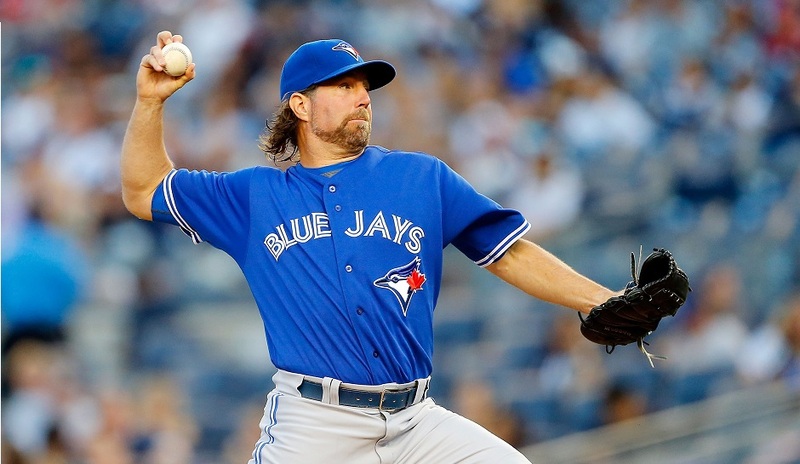 Veteran knuckleballer R.A. Dickey is still here, bringing his brand of consistency. The 41-year-old has pitched over 200 innings for 5 straight years, is rarely injured, and delivered 2.3 Wins Above Replacement a season ago. He will continue to be the rock for the Jays. Estrada is coming off of his best season ever, posting a 3.13 ERA over 181 innings en route to 3.6 WAR. While he can certainly look at 2015 as a good year, his home run rate elevated (1.2 per nine innings) while his walk and strikeout rates went the wrong direction. To avoid a regression back to the mean for Estrada he needs to keep the ball down and establish with his breaking ball. If he can throw his slow stuff for strikes and not leave hanging pitches up high he should be a solid middle of the rotation arm. J.A. Happ, a Blue Jay from mid-2012 through 2014, has been full of potential but has failed to register that on the field. He was throwing a disgusting 4.64 ERA in 108 innings during his time with Seattle last year before being traded to Pittsburgh where he overhauled his delivery and pitched to a 1.85 ERA over his final 63 1/3 innings. He will look to carry that success over this year. Finally, Aaron Sanchez is another young arm with plenty of potential as shown by his 3.22 ERA in limited work last year before landing on the DL. He returned to the team as a bullpen arm to finish out 2015, but after a great spring he is firmly locked into the rotation as manager John Gibbons will expect him to step up his game this year. Jesse Chavez will be the first guy off the bench, so to speak, if any starter struggles or gets injured. Chavez looked like a bonafide starter after a strong 2014 campaign, but he struggled a season ago for the A’s and will now start the season as a bullpen arm. And speaking of bullpen arms, the Blue Jays have three great ones in Cecil, Storen, and Osuna. Cecil will continue to be the team’s 7th/8th inning guy who will be called upon to get tough lefties out while Storen should begin the year as the set-up man for Osuna. 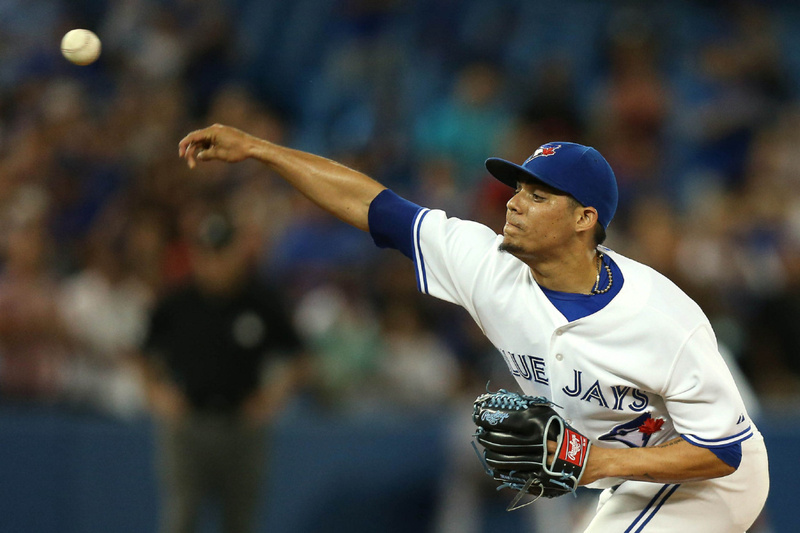 Osuna, a rookie in 2015, was excellent after becoming the closer midway through last season, saving 20 of 23 chances. He will have to keep that effectiveness up though to prevent Storen from taking over the 9th inning. Storen was an excellent closer for the Nationals a year ago before Washington traded for Jonathan Papelbon at the deadline and unceremoniously bumped him to the set up role. He is the ideal change-of-scenery type who could thrive as either a set up man or closer if the team needs it. Let’s just hope he keeps his head on straight and doesn’t go around punching lockers again. It has to be Stroman. After letting Price walk, Storen is now looked upon as the de facto ace of the staff. He needs to live up to that for this team to compete in what is a very strong AL East with very good lineups. He has all the tools to be great, but he will have to prove that on the field while staying off the DL. If Stroman struggles, expect the Blue Jays to try and find another midseason arm to sure up what is clearly the weakest spot on this team. Vice versa, if Stroman pitches to the level Jays’ fan are hoping for, this could become an even more dangerous team then they already are. 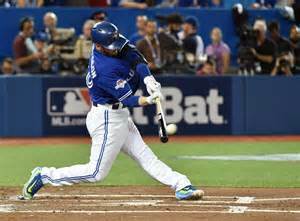 HBT’s Prediction: 2015 saw the Jays shock the world and storm into the playoffs like a bat out of hell. In 2016, no one will be be taking this team for granted. For the first time in 20 years they will have a target on their back from day 1 and it will be interesting to see if playing the role of favorite will effect them. What we do know about this team is that they will hit the cover off the ball, but with uncertainty in the rotation and a greatly improved Red Sox team coupled with a dangerous Yankees team, the road will be much harder to repeat as AL East champs. If Stroman struggles, the lack of a truly dependable starter will hurt this team greatly. 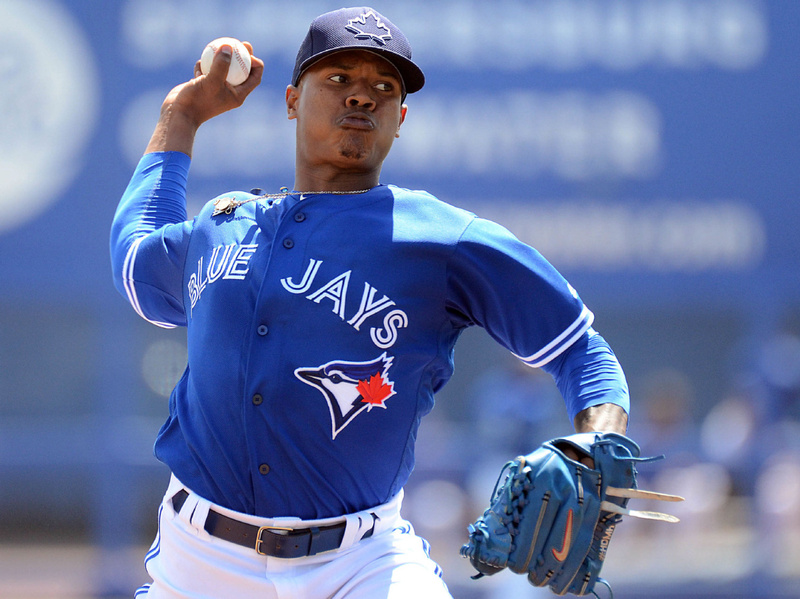 I happen to think that Stroman is still a year away from fully realizing his ace-level potential and regression from the offense will mean a few less wins. However, with all that being said, I think there is just enough for this team to get back to October as they pull of 90 wins, just good enough to overtake the Yankees and Red Sox and repeat as AL East Champions.